These are the five elements of creation. It is their interaction that creates Mana, the energy of magic. Perhaps the best known treatise on the interaction of the 5 elements to produce Mana is that by Heward. Each of the five elements exists in their raw form in their own dimension, or plane of existence. It is the intersection of the five elemental planes that forms the Planes of Man. The entire physical world is nothing but a collection of objects constructed from these five elements. The first four are generally familiar to most individuals as the encounter reflections of these elements within their every day life: the dirt beneath ones feet, the air one breathes, the fire one cooks dinner with and the water one must drink to live. The fifth however is less well known, and while it is omnipresent it is also elusive and ephemeral. The fifth element, spirit sometimes referred to as Animae or the Element of Man is the raw essence of the life force. That which we call life is matter from the combination of the first four elements, infused with spirit or animus. Animus is the reflection of Animae on the Planes of Man. All of nature is dictated by the interaction of the elements, Astrology is the science that tells us how. 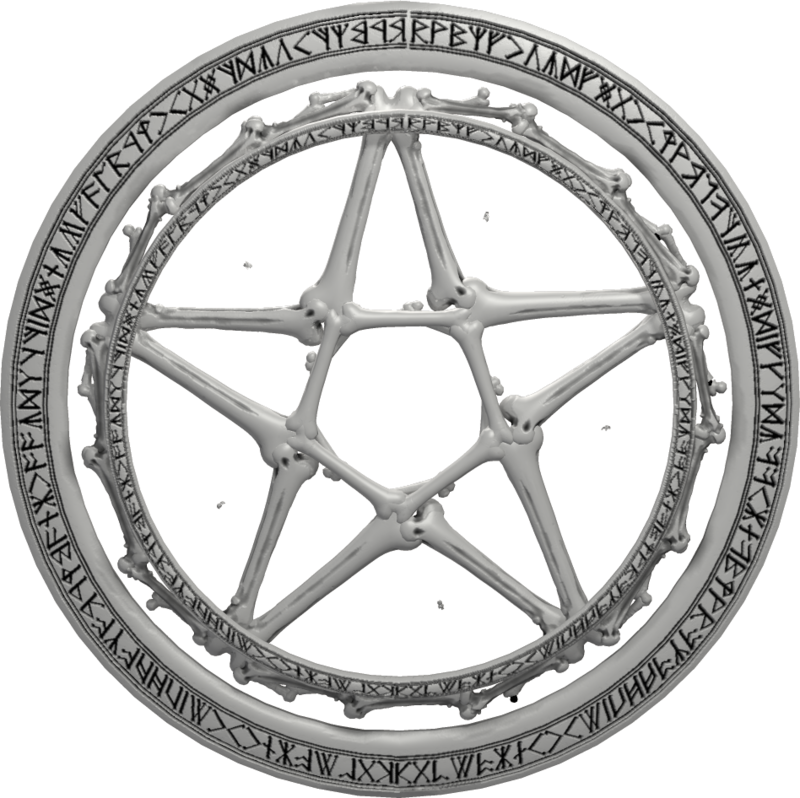 The pentagram, so crucial a tool in the conjuration of creatures is the perfect ward containing all five elements. A pentagram has five "corners" if you will, each of which represents one of the five elements. The exact nature, positioning and the five elements within the pentagram varies upon usage and need. Below is a very simple traditional arrangement of the five elements within the pentagram. Further, the usage of a pentagram is also influenced by astrological factors as well as the current environment. Within various religions and pantheons there are always avatars and/or angels assigned to correspond to each element and for certain invocations these beings may stand guard or lend their presence on behalf of their element. A Pentacle is a combination of a pentagram and other runes, symbols and logic enscribed upon a surface. The runes of and symbols of a pentacle provide modifiers, or enhancements and instructions to pentagrams basic function. In essence, a pentacle is an inscribed spell based upon a pentagram. Multiple pentagrams are often combined together in a single pentacle each serving as building blocks, along with runes and other shapes and symbols of an inscribed spell. Further pentacles often include braziers located either in the center of a pentagram or at the node points of a pentagram depending on the nature of the spell being constructed. Braziers typically contain materials that provide fuel for the spell. Often fire is used as the mechanism for immolation; however. acids and solid catalysts can also be used to consume the material depending on the nature of the material and the requisite elements to be invoked. Below is a more complex pentacle enscribed upon both human and shaved dragon bone. The Pyromancer Gastrope, recently employed by the Wizard Exador.